There was once an argument in the Robertson household that Andy, now Liverpool's left-back and Scotland's captain, wasn't the best footballer within its four walls. For those with siblings, the source of that petition will come as little surprise. Elder brother Stephen, then an aspiring ‘fox in the box’, staked his own claim to the title – one he would later willingly abdicate on the road to Robertson junior reaching the highest level of the European game. “He didn’t move much, he was a bit of a static striker but scored a lot of goals,” Andy begins to tell Liverpoolfc.com when his chuckle at the memory subsides. In truth, Stephen – like all of the close-knit Robertson family – had been backing his self-confessed ‘annoying’ little brother all the while. “Everyone focuses on sacrifices – he had to make a lot for me to get where I am,” says Liverpool’s No.26 during a chat at Melwood. “I’m sure it would have been tough for him at times, if my mum and dad were going to watch me wherever it was in the country and he was left with my auntie and uncle, or on his own when he was old enough. “But they were sacrifices he was willing to make and when you look at it, fair play to him because he could have dug his heels in. He was happy. “I went to support him and he went to support me as much as we could. That’s the relationship we had and we still have. 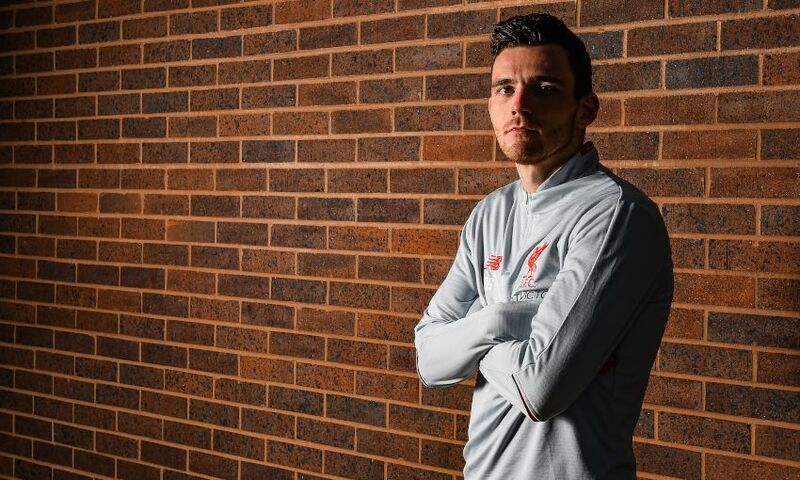 Robertson’s journey from rejection to Red is, by now, a familiar fable. There was the difficult conversation with mum and dad when, with his Celtic dream unfulfilled by a heartbreaking release from the club at 15 and a chance in the Queen’s Park first team yet to materialise, the Glaswegian stared soberly at a metaphorical crossroads. A professional football career remained a possibility down one path. The other would take him back into formal education with the goal of teaching rather than playing sport. In another life, he would have been overseeing PE lessons. ‘Give me a year,’ he told them then. “A lot of parents might have said no,” the defender reflects now. “At the start they were quite happy with me not having a job, and so was I, because the plan was to go to the gym during the day and bulk up – because I was quite slim – and practise football, go to training and be ready for training. “But then I turned 18 and I needed money, I needed a job. All my pals were going on nights out or out for dinner, and I was borrowing from my mum and dad. I knew they would give me it but probably weren’t happy doing it, and I wasn’t happy taking it, so I needed a job and luckily I got it. “But it didn’t take my focus off. On my lunch break I went to the gym; I worked at Hampden so all the facilities were there and I could do that. It didn’t take my focus off football and luckily it paid off in the end. “I did apply for a couple of uni courses, but by the January or February of the season I knew at the end of the season there was going to be at least two options of full-time football. I knew I could put that on the backburner and I was at least going to have a crack at it, get maybe one year of full-time football and see what would happen. That season in Scotland’s fourth tier with Queen’s Park, another at top-flight Dundee United and three years representing Hull City catapulted Robertson to Liverpool in the summer of 2017. After a patient wait until the December to break into Jürgen Klopp’s starting XI, he never looked back, commanding the left-sided berth all the way through to the Champions League final and, this season, a serious tilt at the Premier League title. His performances on the pitch, typified by energy and creativity, have deservedly won and retained the affection of Reds fans, but so too have his humility and ethics off it. Those latter characteristics, his obvious social conscience – evidenced, for example, by the support for foodbanks carried with him to Merseyside – can be traced, once again, to his upbringing. “My mum and dad worked their whole life. Now they’re retired. I was always brought up with that attitude of working,” he explains. 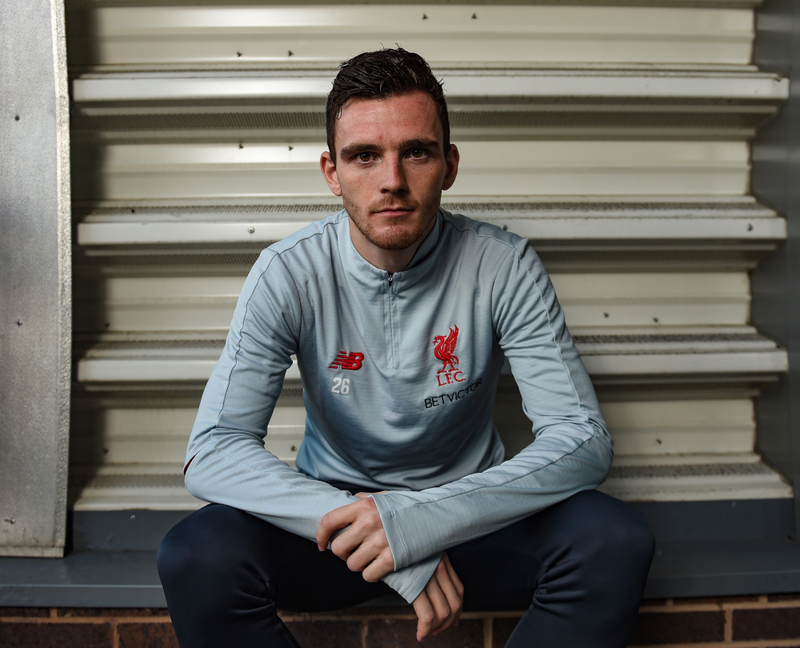 Robertson’s rapid escalation from a now-famous 2012 Tweet – ‘Life at this age is rubbish with no money #needajob’ – to the game’s elite level, celebrity status and, last month, a new long-term Liverpool contract has not worn away at his connection to the real world. His closest friends remain those he met at nursery 20 years ago, their kinship surviving the natural scattering of individuals across different locations and jobs. A genuine perspective shines through much of his conversation and he shies away from the suggestion of being a role model outside the 90 minutes he spends playing each week. “Of course it’s easy to get carried away but it’s about trying to see the bigger picture,” he replies to a question about balancing working-class roots with the trappings of professional football. “I’ve got responsibilities now in terms of two children, who will hopefully be here in this world a long time after me; it’s about setting them up for the future as well and about looking after my family. “You can get carried away and buy nice things – I’m definitely not against that because you’ve worked hard for where you get. If you want to treat yourself then you deserve a treat. Everyone does that – it’s in different scales maybe, but if you get a bonus or your monthly wage people will buy themselves a nice thing. Whether that’s £20 or whatever, it’s still the same principle. Nothing keeps you grounded quite like being a parent, either. Many are the evenings when Robertson must swap the adrenaline rush of a Liverpool fixture for his share of baby duties to 18-month-old son Rocco and newly-born daughter Aria, alongside his partner, Rachel. “Of course, that always happens,” he laughs when asked how often he’s dealing with nappies within hours of receiving adulation at Anfield. “Luckily, we’ve got the first one in quite a good routine now; if it’s a night-time game he’ll be in his bed and I’ll see him in the morning. The second one is too young just now and of course there are times where you’ve played a game – maybe won it and played well – and then two or three hours later you’re there changing a nappy or being sick on or whatever is happening with her. “But that’s part and parcel of it. There are a lot of people who do normal jobs and they are going through the exact same. Football is our job – it’s the best job and effectively a hobby – but it’s still a job. A lot of parents are teaching for the day, for example, then come back and need to be parents. Robertson turned in another assured performance on Saturday afternoon as Liverpool shrugged off successive draws to emphatically defeat Bournemouth 3-0 at Anfield. His eighth assist of the season teed up Georginio Wijnaldum for a memorable lobbed finish while his defensive diligence contributed to a 14th clean sheet of the Premier League campaign. But in the unlikely event the Scot ever allows such form to go to his head, there is a queue of constructive critics waiting to plant his feet firmly to the floor. “I can play the best game in the world but have made one mistake – say I’ve slipped or kicked the ball out of the park – and I’ll walk in to see my pals afterwards and that’s the one thing we’ll be talking about,” says the 24-year-old. “That’s the way it has always been, whether I was at Queen’s Park or at Liverpool – and it helps. If I was surrounded by friends saying how great you are then it might be different. “In terms of support, my missus is different class. She’ll go to every home game she can. Of course, away games are more difficult. But she’ll go to every home game and won’t miss one. “If she does have to miss one she’ll be gutted about it. She loves going to the game and loves supporting me. “She’s got better at it. When she first moved down with me, I used to get her post-match analysis when I walked into the house and that was the last thing anyone wants. It was quite harsh, actually! If I made a mistake or had a bad game, she would be the first to tell me. While the times of taking four phone calls a day from his mum upon leaving Scotland for Hull in 2014 have gladly passed – ‘I had to tell her to stop!’ – the Reds star’s pride at the close relationship with his parents is clear. And their regular trips to Merseyside have allowed Mr Robertson to meet a man who achieved the greatest possible success when he swapped Glasgow for Liverpool four decades before Andy. “We go through the lounge that Kenny Dalglish is in for every game,” reveals the full-back. “With what he did for Celtic, my dad loved him. It’s probably similar to my era of loving Henrik Larsson. “My dad has always been a Celtic fan through and through but he started to keep an eye on Liverpool once Kenny went down there – because of Kenny Dalglish, effectively. “The first time he met him was the last game of last season, against Brighton. I’ve never seen my dad starstruck, I think he was a bit lost for words. It was nice to see because you very rarely get to see that. “Kenny has been great with me and great with my missus since we moved down. All his family have been great with us. But how do these personal traits of the man influence the mentality of the footballer? Did the prospect of his career failing to take off, real as it was, instil a fearlessness in Robertson? A sense that he has nothing to lose? “My attitude when I go onto the pitch has always been fearless. I’ve never gone into a game fearing anything or anyone,” comes the response. “We’re in a game where mistakes happen and it’s how you deal with that. You’re in a game where you can become a hero. It’s all about dealing with that. [My upbringing] probably does have a bit to do with it. “I wouldn’t say I’ve got nothing to lose because now the stakes are high. Of course, if you drop below [your standards] you’ve got your position to lose. “My attitude going into games has always been fearless, to try to enjoy every minute of it and give 100 per cent. I’m realistic – every game, not all of us can play to the highest of our ability. 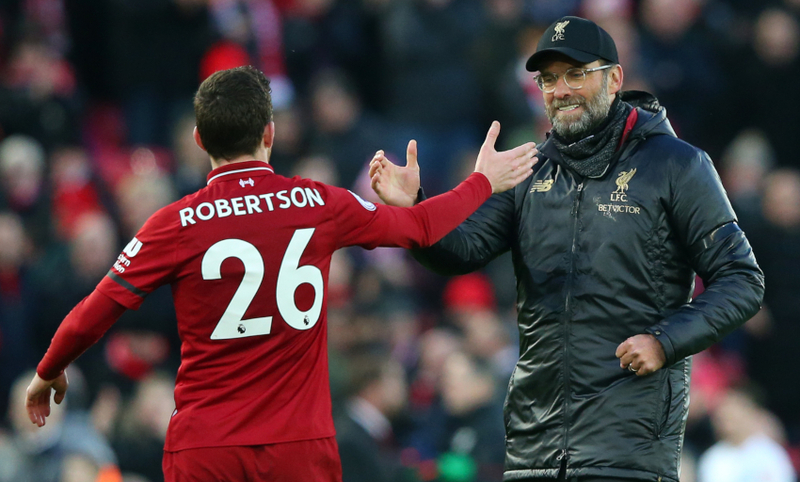 It’s one that may see Robertson’s journey become a true fairy tale, if Liverpool can achieve the glory they crave in the Premier League and Champions League.